Under the leadership of Dr. Susan Rodger, a Psychologist at Western's Faculty of Education, and former School Psychologist, a team of classroom educators, curriculum faculty, school mental health leads, researchers and school leaders came together to have conversations about developing resources with teachers, designed to support their work with students experiencing mental health challenges, and also to support the mental health and wellness of teachers. Teach Resiliency is an online resource delivered to educators free-of-charge. Dealing with mental health in the classroom can feel isolating, frustrating and overwhelming so Teach Resiliency offers an opportunity to access searchable and relevant evidence-based resources and strategies to support mental health at school and work and connect with people in the know and gain practical tools to support your own journey in the classroom. Teach Resiliency uses language that teachers use when describing behaviour and emotions to search for resources. Teachers often don’t have a diagnostic label for a child or youth, but they do know what they see in the classroom – so using search terms like “stress” or “fatigue” can be more helpful than the name of a disorder or illness. Dr. Rodger and colleagues Dr. Alan Leschied and Dr. Kathryn Hibbert have worked with a dedicated team of educators, school leaders and mental health professionals to turn research into evidence-informed resources that are now widely available. The resources are presented in a variety of formats to respond to the information and access needs of teachers- from podcasts to videos and books to short articles, users of the site can filter the results by media type, age group, and audience and choose the resource that fits their needs in the moment. 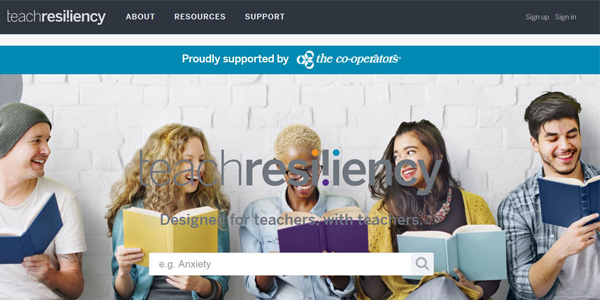 Teach Resiliency continues to develop and will soon feature a community of practice component and blog, and the companion site for French language users will be available in late 2017. Supported by Physical Health and Education Canada, a national professional teacher association and working in partnership with CAMH, TeachResiliency.ca is designed to be innovative, relevant and responsive to the needs of today’s teachers as they support their own – and their students- mental health and well-being. What did you wish you knew as a teacher?